The Imjin War (one of many names for the conflict, chosen here for its brevity) is not very well known outside of northeast Asia, yet it was a massive and significant conflict in world history. It represented a major challenge to the prevailing world order in East Asia, marked a shift in the history of Japan and the still tense relationship even today between the Japanese and Koreans. 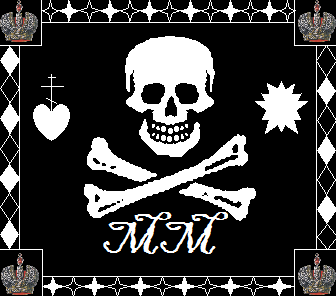 It principally involved three powers; the Empire of Japan, the Joseon Kingdom of Korea and the Empire of the Great Ming or China. Had it ended differently, the entire history of Asia would likely have been vastly different and building on that the history of the rest of the world would have unfolded differently as well. Of the three participants, Japan was a newly united country, forged in fierce civil conflicts, proud and ambitious. Korea was under relatively new leadership, still trying to assert its own place in East Asian politics and the Ming Empire of China was at its apex and the beginning of its decline. For the initial background, we must first look to Japan. The reunification of Japan, at the end of the “Warring States Period” is often helpfully described in terms of a house. Oda Nobunaga laid the foundation, Toyotomi Hideyoshi built the house and Ieyasu Tokugawa lived in the house. The famous warrior Oda Nobunaga had made the initial steps towards the reunification of Japan. 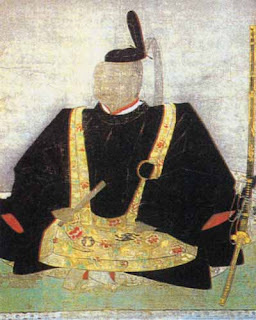 Following his assassination, his cause was taken up by Toyotomi Hideyoshi, a man western historians would later nickname “the Napoleon of Japan”. He succeeded in uniting the warring states under his leadership though, being a self-made man of humble origins, he could never become Shogun. 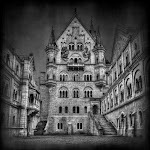 Nevertheless, he was given a title, sometimes translated as “Chancellor” or something similar, and he looked abroad to pursue his destiny. 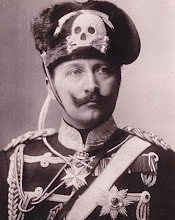 His dream was to conquer China and then India, taking control of the Silk Road and its lucrative trade, leading the Empire of Japan to dominate Asia. If this seems fantastic, remember that this was after Genghis Khan had taken the disparate tribes of Mongolia, united them into a single nation-state and led them to conquer China and then a larger empire that stretched from the Korean peninsula to Eastern Europe. 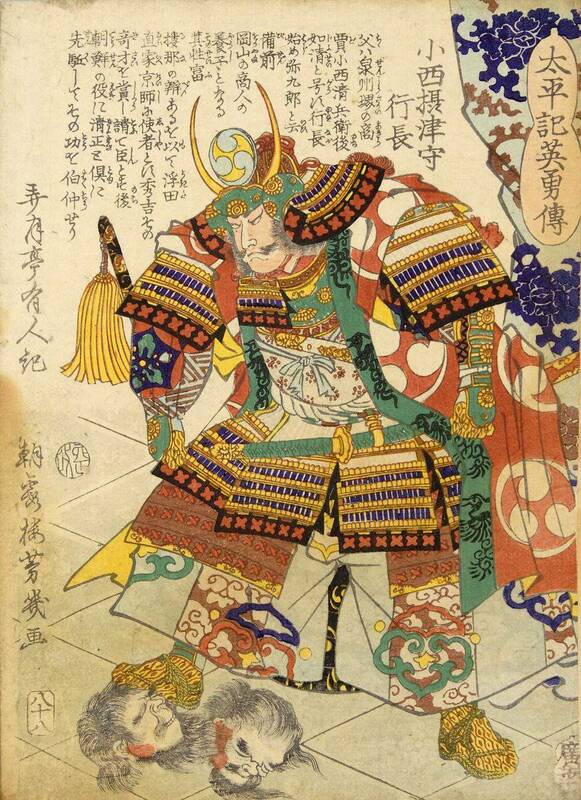 Lord Hideyoshi, an ambitious man with many armies of samurai hardened by fierce battles among themselves, may well have thought to himself that if Genghis Khan of the Mongols could accomplish such a thing, so too could Toyotomi Hideyoshi of the Japanese. For Japan to invade China, the only possible invasion route was the Korean peninsula where, not too long before, the Joseon Dynasty had seized power and had compensated for their lack of ancestral legitimacy by obtaining the recognition of the Ming Emperor in China as a vassal state. For the Chinese, this meant that Korea belonged to them but for the Koreans it meant nothing of the sort. They ruled their own country but, as with other neighbors of China, would pay tribute to the Ming court in exchange for trade and recognition. 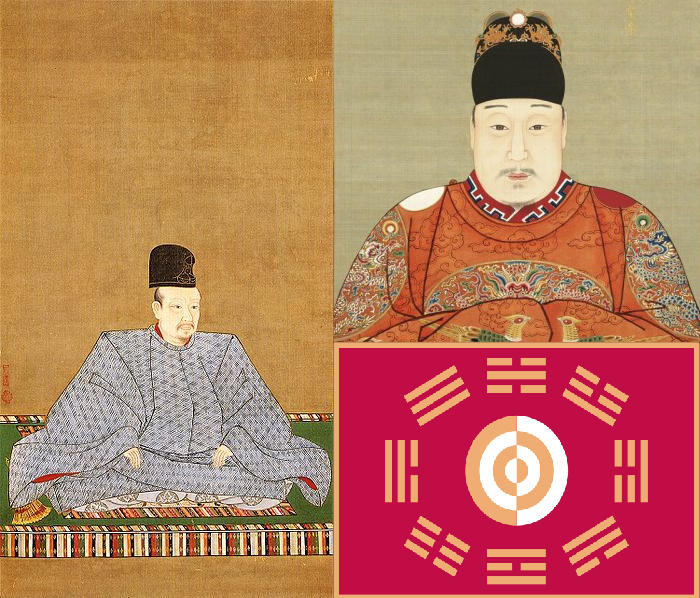 When the war came, Korea was ruled by King Seonjo, a man who worked to improve education and government in his kingdom. However, a diplomatic exchange of gifts with Hideyoshi gave the Japanese ruler the mistaken impression that the Koreans had voluntarily become vassals of Japan, which had not been the Korean intention. When he prepared to embark on his war against China, he invited and expected the Koreans to join him in this grand enterprise. Hideyoshi would be disappointed on this subject but King Seonjo also had other problems to deal with. Not only were there rival factions at court vying for power but the country was also divided north and south with the north worrying about the gathering strength of the Manchus and the south worrying about the growing power of Japan. On April 13, 1592 the first elements of the Japanese invasion landed at Busan with their commander, Konishi Yukinaga, sending a subordinate ashore first to ask one last time for Korean cooperation in their war with China. He was refused and the war began with the siege of Busan. 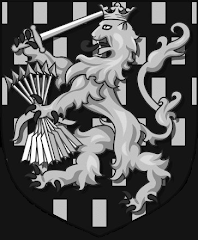 Having obtained firearms from the Portuguese some time before and with an army of veterans of the fierce fighting of the “Warring States Period” the Japanese forces were far superior to the Korean defenders. 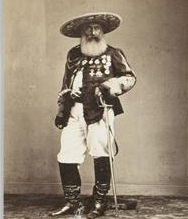 Busan, Fort Dadaejin and the city of Dongnae fell to the Japanese in quick succession. More reinforcements followed and, though this is not often remembered, the Japanese invasion of Korea represented the largest amphibious assault in world history up to that time. The other Japanese divisions spread out and soon occupied Gyeongsang Province. The Koreans mobilized to meet the invasion with an army under General Yi Il, however, his archers proved no match for the ranks of Japanese musketeers and he was outmaneuvered as well. The resulting Battle of Sangju was a crushing defeat for the Koreans. They tried to regroup and stop the Japanese at the Battle of Chungju but again, Japanese firepower was devastating and the Koreans were defeated. The only major problem for the Japanese was that their victorious troops were advancing farther and faster than planned, causing some dissent among their commanders who accused the leaders of the initial wave of being glory hounds. 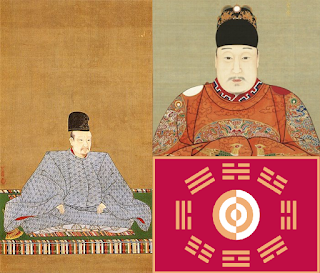 King Seonjo fled from the capital of Hanseong (Seoul), which was soon captured by the Japanese and some Korean commanders, such as those charged with defending the Han River, retreated without resistance. The Koreans were forced into a massive retreat, doing their best to simply hamper and delay the Japanese as they fled north. At the Imjin River, which slowed the Japanese advance, the Japanese again called on the Koreans to stop resisting and join them in an attack on China but, once again, the Koreans refused. The King retreated to Pyongyang with the Japanese First Division pushing north behind him while other divisions fanned out to secure control of the rest of the Korean peninsula as they advanced. As city after city fell to Konishi Yukinaga of the First Division, he was joined for his advance on the northern Korean capital by the Third Division under Kuroda Nagamasa. The Koreans tried to even the odds against them by launching a surprise night attack on the Japanese camp which was initially successful but which also exposed their position, allowing the Japanese to swing around and attack them from the rear. The escapade ended in chaos and as the Koreans retreated, the Japanese paid close attention to how they crossed the Taedong River, so they would know where to take their own forces across. When they made their advance on Pyongyang on July 20, 1592, they found that the King and remaining Korean forces had already retreated, leaving behind huge stockpiles of food and supplies. Meanwhile, the other Japanese divisions consolidated their hold on the Korean provinces, eliminating local resistance and establishing Japanese governors and administrators. Before the year was out, most of Korea had been conquered and the Japanese could look forward to their invasion of China, by way of the Jurchen territory, later known as Manchuria. 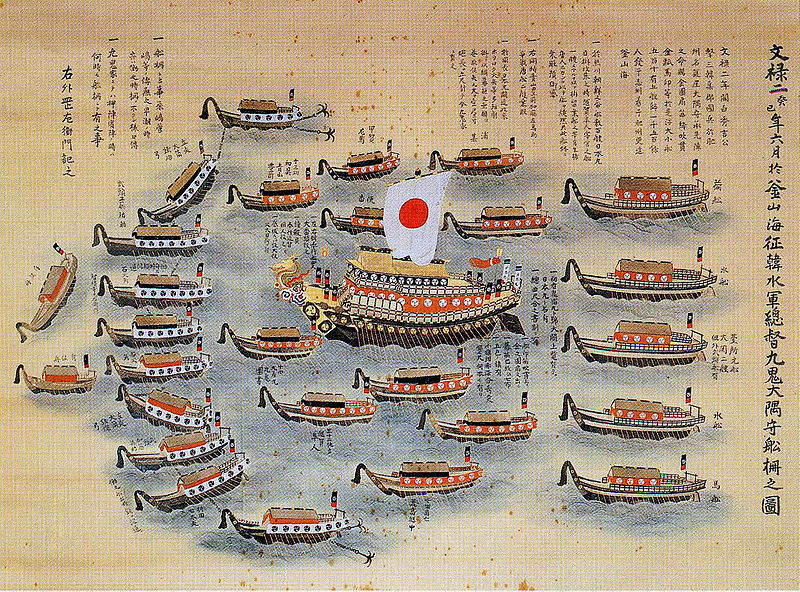 All in all, 1592 had been a year of swift and decisive victories for Japan on the Korean peninsula. The Japanese armies had totally dominated the battlefield with superior weapons, superior tactics and greater skill. However, the Koreans were not without some victories of their own, it was only that these would not be won on land. Admiral Yi Sun-sin proved to be the most brilliant naval commander of his age in East Asia and in numerous battles totally defeated the Japanese whose ship designs and tactics were not as advanced as the Koreans. This had a major long-term impact on the conflict as it severely complicated the logistical situation for the Japanese armies. Things would, at one point in particular, get very bad for the Korean navy as the force was often cannibalized to make up for losses by the army, however, the Japanese were never able to defeat Admiral Yi Sun-sin. 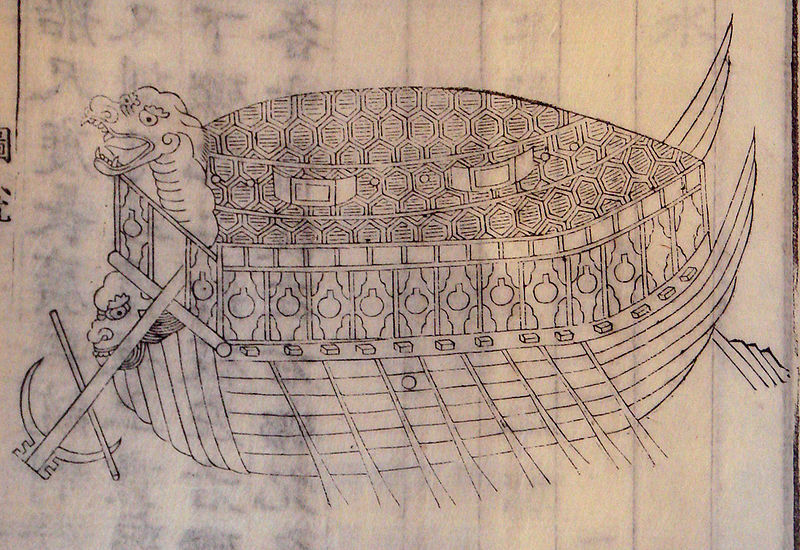 The one thing Admiral Yi Sun-sin is most famous for, certainly beyond Korea where he is a celebrated national hero to this day, is his innovative design known as the “Turtle Ship” (or Geobukseon). 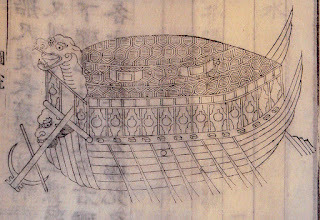 Today, any Korean will proudly tell you that the Turtle Ship was the first armored warship in the world. That, however, is an arguable point. 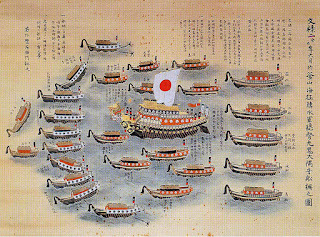 The Japanese, namely Oda Nobunaga, had Tekkosen or “iron ships” in his naval arsenal, though these were more like armor plated floating fortresses rather than sea-going naval vessels. 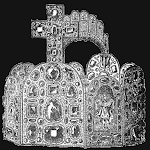 Before that, the Italian sailors of the Republic of Venice also had an armor plated flagship for their fleet. However, people can argue over bragging rights all they like but the armor was only one aspect of what made the Turtle Ships unstoppable. They were also completely enclosed and covered with spikes to repel borders. 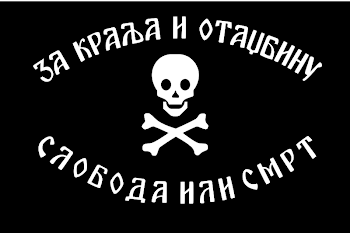 This was something that the Koreans had in common with the English ships who repelled the Spanish Armada. Admiral Yi Sun-sin designed his vessels to fight from a distance with naval cannon whereas other ships in those days were basically floating castles filled with soldiers which would ram each other and allow the warriors to fight for control of the vessel. The Japanese, more experienced at man-to-man combat, excelled at this and so, Admiral Yi Sun-sin wisely appreciated the strength of his enemy and had his ships fight with cannon rather than up close with swords. He would only go in for close combat against the Japanese when he had them severely outnumbered. As a result, the Koreans won battle after battle on the naval front. On September 1, 1592 Admiral Yi and his Korean fleet launched a surprise attack on the Japanese at Busan Bay in an effort to completely cut off from the Japanese armies in Korea from their home islands. It was an overwhelming tactical victory for the Koreans but did not change the strategic situation. The Korean fleet could not sustain itself in the area and had to withdraw, leaving Japan still in control of Busan. However, it did mean that the Japanese could not use the waterways to their advantage and this basically eliminated their plan of sending over more men and supplies for a full scale invasion of China and march on Peking. 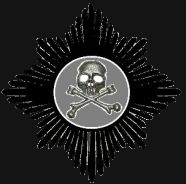 The Koreans also organized a highly effective guerilla warfare movement known as the “Righteous Army” which won a number of tactical victories against the occupying Japanese forces. By the end of 1592 the Koreans had lost their country and King Seonjo was at the northern border seriously contemplating simply handing his entire kingdom over to China if only they would come to his rescue. The Ming Emperor Wanli, for his part, was rather overwhelmed by the news and shocked that the Japanese, a people the Chinese had always despised and looked down upon, could have conquered Korea so quickly. There had been some local assistance but it was not until January of 1593 that Emperor Wanli dispatched a major army to invade Korea and push the Japanese out. 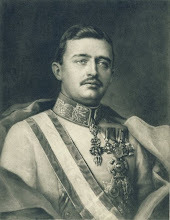 The King of Siam, another tributary of China, offered to attack the Japanese home islands but the Ming court refused the offer, not wanting to complicate the situation. 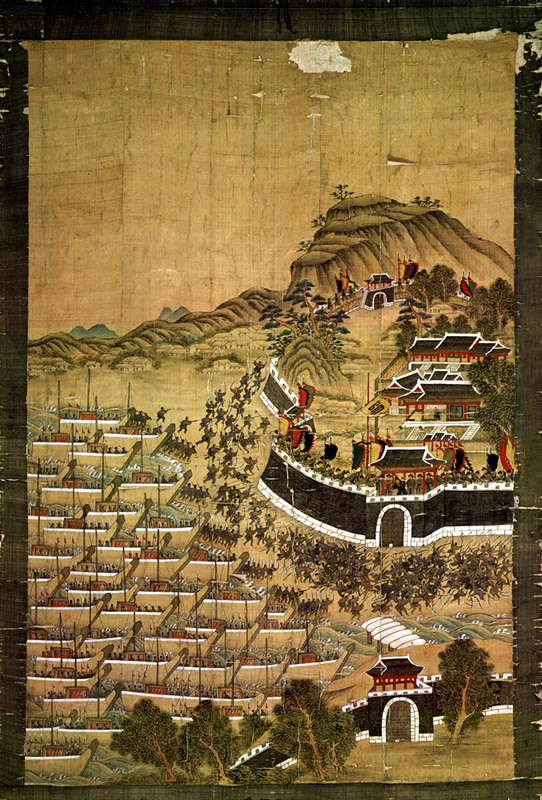 On January 5, 1592 a Ming army of over 40,000, including a Korean contingent, arrived to besiege the 18,000 Japanese warriors garrisoning Pyongyang. Using a massive artillery and rocket bombardment, the Chinese inflicted over a thousand casualties on the Japanese but had purposely neglected to completely encircle the city so as to allow the Japanese the chance to escape rather than fight to the death. Under cover of darkness, the Japanese finally withdrew and Pyongyang was retaken. This made the Chinese rather overconfident and they continued their offensive south only to be met with a stinging defeat at the hands of the Japanese at the Battle of Byeokjegwan. Despite having a near 2-to-1 superiority in numbers, the Chinese were defeated and suffered heavy casualties, proving to them for the first time just how formidable a foe the Japanese were and, perhaps, making them understand why the Koreans had had so much trouble. The Japanese tried to follow this up but were themselves defeated by the Koreans at the Battle of Haengju on February 12, 1593. This was significant even if only as a morale-booster for the Koreans, proving, under the leadership of General Kwan Yul, that they could beat the Japanese in a defensive battle with carefully prepared fortifications and the proper weaponry. Later, as the Ming and Korean armies moved, more slowly and cautiously this time, south toward Seoul, a team of saboteurs were sent in who destroyed much of Japan’s military stockpiles in the city. This, combined with Korean naval pressure on their supply lines, convinced the Japanese to withdraw from Seoul and agree to negotiate for peace. The Chinese, after their bloody loss at Byeokjegwan, were also eager to end the war. Unfortunately, each side thought the other was suing for peace and basically trying to surrender and this, naturally, was not conducive to ending the war. 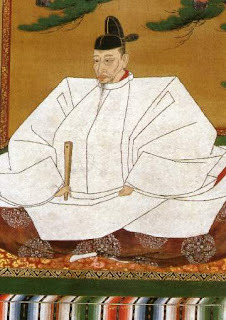 The Chinese thought that the Japanese had agreed to withdraw and submit again to the Ming Emperor as their overlord (Hideyoshi having previously stopped paying tribute to the court in Peking) while Hideyoshi thought that the Chinese were surrendering to him and demanded territorial concessions as well as a Ming princess to be married to the Japanese Emperor Go-Yozei. Neither was true and when each side refused the demands of the other, hostilities resumed after several years of back and forth between the two sides. However, with the resumption of hostilities, the overall strategy and goals of the war, at least for Japan, would be dramatically different than they had been originally. 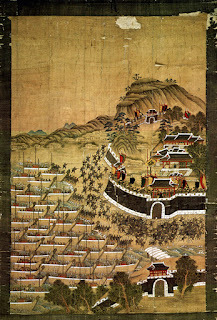 With the huge numbers of Chinese troops moving east, Hideyoshi realized that the conquest of the Ming Empire was hopeless, at least for the moment and so would instead focus on simply retaking and holding the Kingdom of Korea as a Japanese foothold on the Asian mainland, a tributary state and a possible base for future, more ambitious operations. This would impact how the war was fought as previously the Japanese had made at least some effort to win over the Koreans to their side. They hoped all along that the Koreans would simply accept Japan as their new overlord and join them in the conquest of China. Now that the conquest of China was off the table and control of Korea was the only immediate goal, Japanese forces became rather less considerate, to put it mildly, toward the Koreans. It also made a difference that during the years of diplomatic exchanges between Japan and China, the Koreans worked feverishly to rebuild and improve their military capabilities. As a result, when the war resumed, the Japanese found them a much more capable opponent and a dangerous enemy is much less likely to receive mercy than an easily beaten foe. Though more limited, the fighting would often be even more intense. 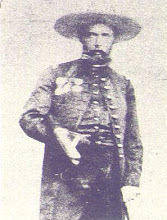 Unlike the first invasion force which, though estimates vary, numbered over 200,000 Japanese troops, the second invasion force would number just over 100,000 under the overall command of Kobayakawa Hideaki, the nephew and adopted son of Hideyoshi. This invasion force, carried by a fleet of 200 ships, landed in southern Korea unopposed in 1597 and began taking control of Gyeongsang Province. 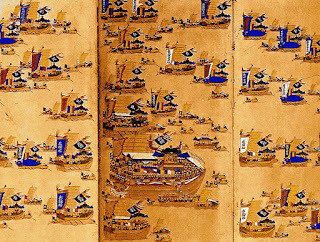 The Ming Emperor Wanli gathered a relatively modest force by Chinese standards with naval support to send to Korea under the command of General Yang Hao, who would have a less than upstanding career. 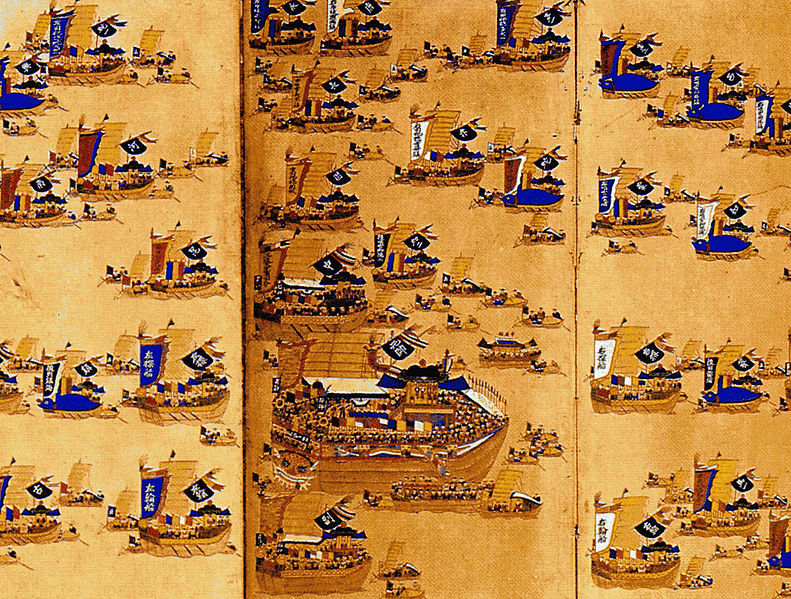 Along with his 75,000 Chinese troops, the Koreans would muster about 30,000 in four armies plus the naval forces. The great Admiral Yi Sun-sin was available but his success aroused jealously at court and a smear campaign of sorts was launched against him until he was dismissed by King Seonjo and replaced by Won Gyun. The new admiral immediately sought out the Japanese fleet and attacked them at the Battle of Chilcheollyang. The result was possibly the biggest and most decisive Japanese naval victory of the entire war. Won Gyun was totally defeated, was himself killed in the battle and the Korean flagship was captured. The Japanese won complete mastery of the area and were able to continue landing men and supplies for the invasion force unimpeded. Korean morale was wounded by this disaster and their defenses began to crumble as the Japanese launched a determined offensive northward. 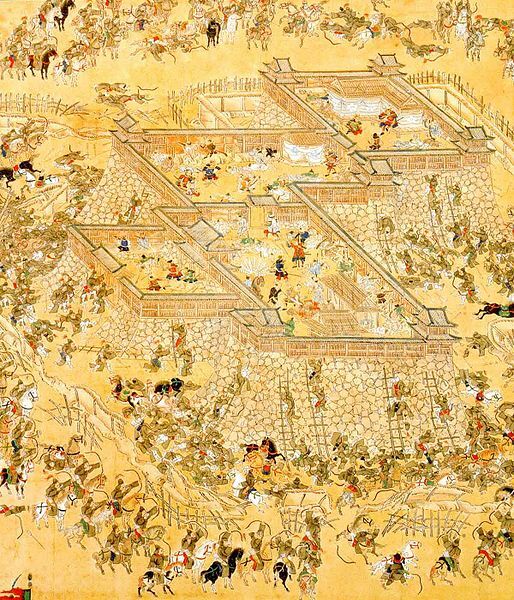 The fortress of Namwon fell, then Hwangseoksan fortress fell with the defenders retreating almost immediately. Ming Emperor Wanli was furious that the Japanese were again advancing on Seoul, reshuffled his military high command and sent General Yang Hao to take charge of Korea. However, the situation was beginning to turn around. 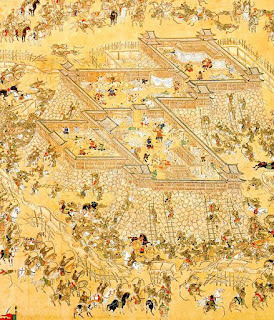 At the Battle of Jiksan on September 7, 1597, although the Japanese won something of a tactical victory, the Ming army was able to block their advance. Also, after the disastrous loss at Chilcheollyang, King Seonjo of Korea stopped listening to the critics and restored Admiral Yi Sun-sin to his old command and the result was a swift turnaround. 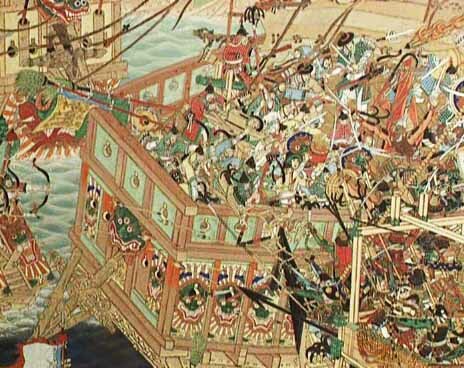 At the Battle of Myeongnyang he defeated a massive Japanese fleet in what is certainly his most famous and celebrated victory. The scale of the success was incredible and was due almost entirely to the Admiral’s skillful placement of his ships and his knowledge of the local waters. With their supply lines imperiled and the Ming armies blocking their path north, the Japanese began to fall back, almost always under harassing attacks by Chinese and Korean forces. The Japanese would give battle when necessary and were never beaten in these attacks but were steadily pushed back by them. A really decisive battle seemed in place at the Siege of Ulsan which lasted from December 23, 1597 to January 4, 1598. The Chinese and Korean forces numbered around 55,500 men whereas the Japanese garrison was only 10,000 with only 13,000 more troops near enough to come to their aid. The Japanese held off these superior forces, despite being nearly starved to death for lack of supplies due to Korean naval dominance of the coast but at the approach of the Japanese reinforcements the Ming General Yang Hao completely lost his nerve and ordered a retreat. Seeing an opportunity, the Japanese forces in Ulsan castle burst out from their fortifications to attack and the result was a humiliating panicked retreat by the Sino-Korean forces. In the disastrous battle the Chinese and Koreans had lost 20,000 men killed while the Japanese dead numbered only a little over 1,000. Later, another Sino-Korean force would try to take Ulsan castle and would again be defeated in September though there was at least no panic and the retreat was orderly. This resulted in a prolonged period of stalemate and an ‘America in Vietnam’ type situation for Japan. Despite winning the major land battles, their loss at sea meant that supplying men and material for an offensive or even a large defensive force was simply impossible and Japanese forces began to be withdrawn from Korea. A renewed Sino-Korean offensive failed to achieve a major breakthrough but nonetheless kept up an unrelenting pressure on the Japanese whose logistics were extremely strained. At the Battle of Sacheon the Sino-Korean offensive was defeated and the Japanese again launched a successful counter-attack and likewise at the Siege of Suncheon a little under 14,000 Japanese troops under Konishi Yukinaga successfully repelled a Sino-Korean attack by 50,000 men with heavy losses, yet these victories did not change the overall strategic situation. The stalemate simply dragged on until September 18, 1598 when Lord Hideyoshi in Japan died. 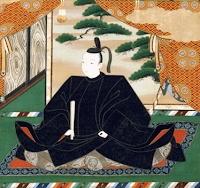 Everyone knew, despite his efforts to secure the succession of his son to his position, that all the daimyo would soon be fighting for power in Japan and so the ruling council ordered a total withdrawal from Korea while keeping the news of the death of Hideyoshi secret in order to preserve Japanese morale. The only major subsequent engagement was the Battle of Noryang Point which was a tactical victory for Korea but a strategic victory for Japan in that they were still able to continue their evacuation. Worse for Korea was the death of Admiral Yi Sun-sin in this battle along with the Ming commander Deng Zilong. Negotiations for the final peace settlement would drag on for some time, long after the power struggle in Japan had been ended with the famous Tokugawa Ieyasu becoming Shogun and establishing the reign of the Tokugawa shogunate which would survive until the Meiji Restoration. Both sides were so entrenched that it took an act of deception, making the Koreans believe the Japanese had submitted to their demands when, in fact, they had not, to formally end the war and reestablish normal relations between the two countries. In retrospect, the Imjin War was extremely significant for the course of the history of northeast Asia and beyond. It weakened the Toyotomi clan of Hideyoshi and helped enable the Tokugawa in seizing power in Japan. It solidified the place of Korea as a vassal of China and reaffirmed prejudices against Japan in their regard that would prove disastrously mistaken over the course of history. Had the war gone differently, had Hideyoshi been satisfied in his ambition to conquer the Ming empire, India and control of the Silk Road, the entirety of Asian history would have been drastically changed. All sides came away feeling rather justified in their own sense of accomplishment. The Empire of the Great Ming had retained the Sino-centric status quo of the existing international order. The Koreans had expelled the invaders of their country after a long and bitter struggle and even the Japanese could boast of having dominated their enemies on the land and withdrawn from the conflict without suffering a major, decisive defeat on the battlefield. All of these sentiments would have an impact on how these countries developed in the centuries to come. Good article, your knowledge of history around the world is simply astonishing. You have more understanding of Asian history than most of Asian people. Weird thing is history tends to repeat itself and the same thing can happen to other places in earth. Like admiral Yi who despite being the good guy was betrayed by his fellow Koreans, General Yue Fei of China was killed by his own countrymen. Right now where I live, anti-corruption officials usually somehow get smeared and involved in some scandals. It is an old story at seems common to the human condition. The Roman general who defeated Attila the Hun, Flavius Aetius, was killed by his own government. Rommel was forced to commit suicide by Hitler, even in this story, in the subsequent power-struggle after Hideyoshi's death, many of the best Japanese daimyos would be put to death for belonging to the losing side. 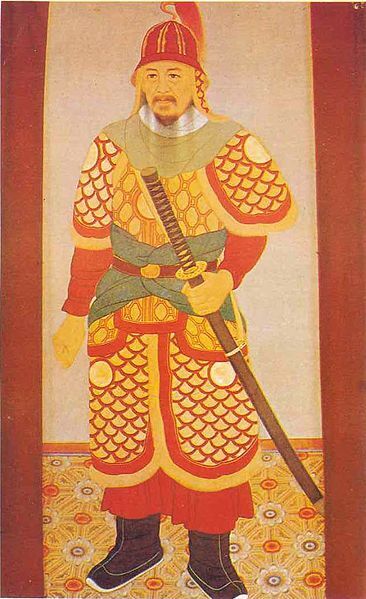 Konishi Yukinaga (pictured above), who led the initial attack, conquered Busan and captured Seoul was one of those who would later be executed by his own people. In his case, it probably didn't help that he was a devout Catholic. It's never a good sign when any society begins punishing success and rewarding failure. You have explained the entire war very well..
Do you think that Admiral Yi Sun Sin can be considered among the greatest admirals in naval warfare? In the pantheon consisting of Chester Nimitz and Horatio Nelson?? That's a good question and one I thought about when writing this up. I'm naturally indecisive so it's hard for me to say. He certainly won battles that were on a level with some of the greatest naval commanders of all time, the problem is that he remains largely unknown outside Korea. I don't know the details of every battle he won but it would also make a difference if he won by some innovation, some tactical masterstroke or if it was because of his particular knowledge of the area that wouldn't translate well to other areas. With Nelson, for example, you had Japanese admirals in World War II still using tactics that he developed. Yi Sun Sin was certainly not as influential, but that could be because he was not well known, it also doesn't help that nothing much changed because of his victories. The war in general, ending the way it did, maintained the status quo and conflicts like that tend to get little attention. Of course, if the Japanese had conquered China, that would have changed everything and everyone would have noticed but, as it was, while his victories had a major impact on the war, the naval front in general was not decisive. 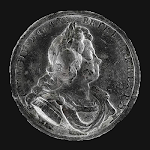 This tends to matter to naval historians who look to admirals whose victories brought about some major change in naval warfare or the course of world affairs like Tromp at the Downs, Nelson at Trafalgar, Togo at Tsushima or Nimitz at Midway. It's why, before World War II, the USA had some great naval commanders but none that really ranked among the greatest in the world because their victories, while sometimes spectacular, were not decisive. In that way he's rather like Admiral Suffren, though Yi's victories were certainly more astounding, particularly if one accepts the Korean version of events. That also may have hampered his reputation somewhat, given that more accounts about his battles are not dispassionate or non-partisan and I could well imagine foreign naval historians looking at the battle of Myeongnyang with accounts of Yi defeating over 300 Japanese ships with only 12 of his own and simply discounting it as too fantastic to believe. Other estimates that the Koreans had 45 ships and the Japanese 120 would still be a huge victory and be easier for people to believe. Still, some do put Yi Sun-sin on the level with Nelson and given the odds he triumphed over, I could certainly accept that. 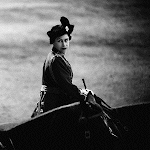 He wasn't as influential but that can as easily be ascribed to circumstances rather than anything else. One could say he *should* have been more influential than he was, though, again, for myself, I would have to know more specifics about his victories to be more certain of that.